You show a little notepad where an empty drawn window is depicted. Have a spectator pick a card and mentally tear off a corner. 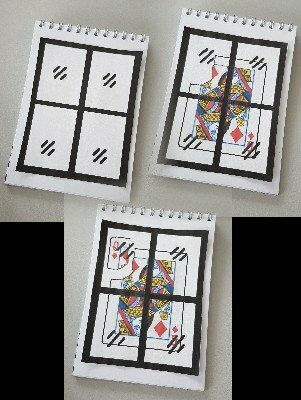 You now throw or cascade the cards towards the notepad and suddenly the chosen card is seen behind the window. However, a corner is missing. Snap your fingers over the missing corner and it appears behind the window. Ideal for strolling and street magic. You will receive PDF templates to print out and an explanation video which explains all the details for preparation and performance.